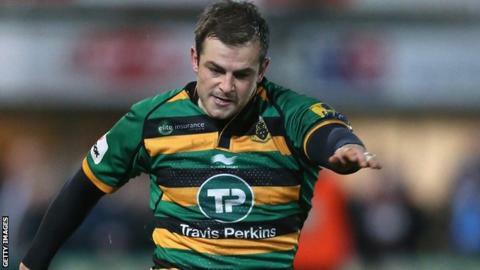 Fly-half Stephen Myler says he is "proud" to join former England international Paul Grayson in scoring 2,000 points for Northampton Saints. The rugby league convert, 30, scored 17 points in Friday's win over Newcastle to reach the milestone. Only Grayson, who scored 2,786 points between 1996 and 2005 before helping bring Myler to the club in 2006, has scored more points for Saints. "I'm proud to be in his company," Myler told BBC Radio Northampton. "It's a very nice milestone to reach. I'm hugely proud I'm still at this club and my focus is always on playing well enough that they want me." Grayson, a former coach at Franklin's Gardens, helped Myler with his cross-code move after leaving Super League side Salford eight years ago. "Paul was hugely influential in my transition from playing league to union," said Myler. "He was head coach when I came over and having him here, having played in the same position I was trying to play, was a big help. He took me under his wing and made that transition very easy. "But I'm constantly learning this game. Having played league and then tried to learn union, my mindset is to keep learning all the time. I don't feel complacent." Myler's 2,000 points have come in 243 appearances, but he denies that reaching individual milestones is as significant to him as the team's success. "What made me come to Saints was the fact that I could see what a great club it was," said Myler. "It was apparent that you could spend a long time here. I've had their support and I've tried to re-pay that. "Paul is very far in the distance and if that happens [and I overtake his points tally], it's great, but it's not the main thing that's driving me. "I won't look back on it at the end of my career as something I was focusing on. I want to focus on getting this team to where it can be." Myler made 22 Premiership appearances for Saints as they won the title last season and signed a new contract in December. "I didn't want to go anywhere else," he said. "I feel that in the last two years in particular, I've been able to put my stamp on the team and my performances have benefited from that. I'm proud to have been here so long but also looking forward with excitement for what's to come." Director of rugby Jim Mallinder, who arrived at Franklin's Gardens the year after Myler, praised the fly-half's consistent performances during his tenure. "He's been so important," Mallinder said. "There's not many players who've been here before me. "He's not flash, even though he does some fantastic bits of skill. What he is is consistent, injury-free, he plays a lot of games, he's instrumental in our attacking game and is so reliable with his goal kicking."